"I think one voice could make a big difference." Hi, I'm Zulmy, and I'm 13 years old. I want to be President of the United States one day. Carmen, my 82-year-old godmother and great-aunt, was the first person in my family to immigrate here from Ecuador, over 50 years ago! I love her very much, but I don't like that she almost never votes. I think voting is really important, so we had a little talk... My godmother Carmen promised me that she'll vote, and I hope that you will too! Zulmy & Carmen Lozano, Director: Adepero Oduye, Camera: Armando Croda & Maria Badia, Sound: Lindsey Cordero, Story: Tim Manley, Editor: Claudia Zamora, Color: Naje Lataillade, Score: Henrique Eisenmann, Music Supervisor: Perry Tal, Producer: Esther de Rothschild, Thank You: Virgilio & Dyna & Mayte & Yamileth & Mary Lozano! 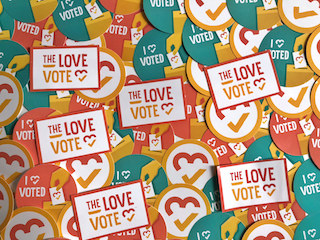 Show Zulmy love + inspire others + get voting info + get event invites + get stickers + create change!